A low key, Wii free day. Saturday was one of those days when we spent way too much time in front of the TV, mostly playing Wii. Lego Star Wars and Guitar Hero 3…we are addicted. So, we decided that today would be Wii free. Wade chose to pay bills and file our taxes. I chose to work on a crafty project for my trip to Anaheim this coming weekend. The boys just played. 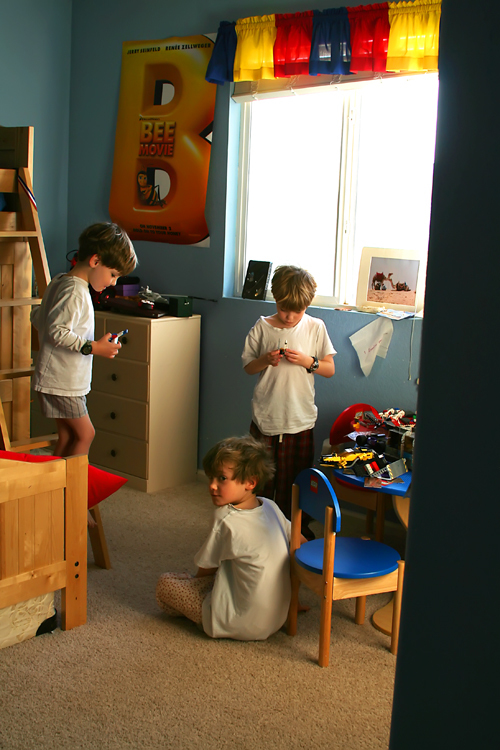 I snapped this picture (almost without being discovered) this morning when the boys were playing legos together. i love days like this where everyone chills. Sounds like a perfect day! The boys look so cute (and focused!). Hey! What crafty project are you working on? And why did no one else ask that? Am I the last to know?